If you have a Personal or Business website that gets regular traffic, and you feel visitors to your site would benefit from a link to www.tools-plus.com, you can qualify to become a Tools-Plus.com affiliate. It's a great way to compliment products or services you're already offering, and it's also an easy way for you to generate additional income. All you have to do is display Any of our Links at your site as frequently as you wish. 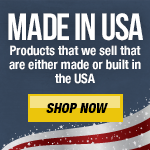 Tools-Plus.com will pay you 5% on all merchandise sold from an order placed through the link from your website. You receive a commission check every quarter - that means you have everything to gain and nothing to lose! 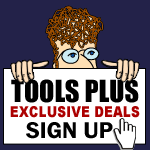 Becoming an affiliate of Tools-Plus.com is absolutely free and includes access to our secure Yahoo! Store tracking manager, so you can keep track of your dollars directly. Tools-Plus.com is all about delivering top-quality, brand name tools and accessories at unbeatable low prices with a premium on customer service. When you become a Tools-Plus.com affiliate, you're helping us help a wider customer base find the right tool at the right price. We hope you understand that the purpose of the Affiliate program is to introduce new customers to TOOLS-PLUS and not to be used as a discount from our already guaranteed lowest prices.